Getting “funded” is the holy grail for most entrepreneurs. Unfortunately in early stage startups the drive for financing hijacks the corporate DNA and becomes the raison d’etre of the company. Chasing funding versus chasing customers and a repeatable and scalable business model, is one reason startups fail. This post describes how companies using the Customer Development model can increase their credibility, valuation and probability of getting a first round of funding by presenting their results in a “Lesson Learned” venture pitch. It should go without saying that this post is not advice, nor is it recommendation of what you should do, it’s simply my observation of how companies using Customer Development positioned themselves to successfully raise money from venture investors. In a traditional product development model, entrepreneurs come up with an idea or concept, write a business plan and try to get funding to bring that idea to fruition. The goal of their startup in this stage becomes “getting funded.” Entrepreneurs put together their funding presentation by extracting the key ideas from their business plan, putting them on PowerPoint/Keynote and pitching the company – until they get funded or exhausted. What are Early Stage VC’s Really Asking? Given that the traditional pitch has no hard customer metrics, (and VC’s don’t demand them,) you get funded on the basis of intangibles that vary from firm to firm: Do you fit the theme or thesis of the venture firm? Did the VC’s like your team? Do they believe you have a big enough vision and market. Did the partner have a good or bad day, etc. Tons of advice is available on how to pitch, present and market your company. I believe all this advice is wrong. It’s akin to putting lipstick on a pig. The problem isn’t your pitch, it’s your fundamental assumption that you can/should get funded without having real customer and product feedback. No amount of learning how to get a VC meeting or improving your VC demo skills will fix the lack of concrete customer data. You might as well bring your lucky rabbits foot to the VC meeting. In contrast, if you are following a Customer Development process you have a greater chance of getting listened to, believed and funded. Just as a refresher. The first step in Customer Development was Customer Discovery; extracting hypotheses from the business plan and getting the founders out of the building to test the hypotheses in front of customers. 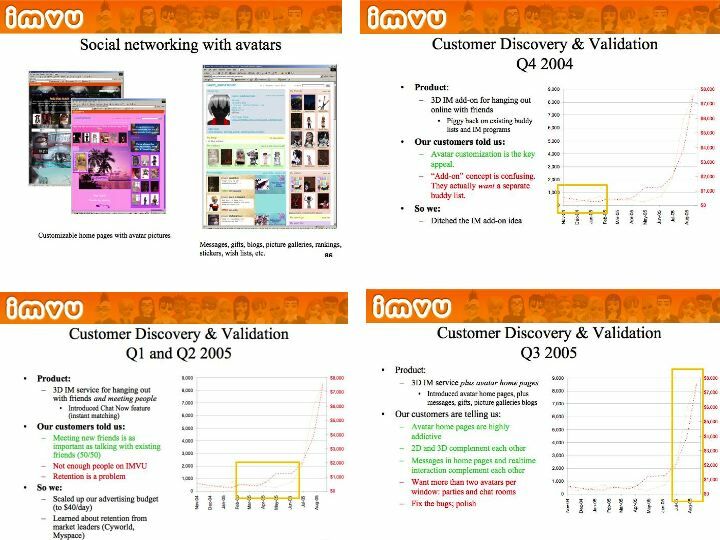 Your goal was to preserve your cash while you turned these guesses into facts and searched for a repeatable and scalable sales model. Your proof that you have a business rather than a hobby comes from customer orders or users for your buggy, unfinished product with a minimum feature set. If you’re following Customer Development you are now raising money because even with this first rev of the product you think you’ve found product/market fit and you want to scale. If you’ve actually been doing Customer Development at a minimum you’re at step 3 or 4. If not, you don’t have enough data for a VC presentation. Get out of the building, get some more customer feedback, spin your product and go back and read the book. Telling the Customer Discovery and Customer Validation story this way allows you to take VC’s on your journey through all the learning and discovery you’ve done. After three of these slides, smart VC’s will recognize that by iterating on your assumptions you have dramatically reduced risk– on your nickel, not theirs. They will realize that you have built a startup that’s agile, resilient and customer-centric. Your presentation doesn’t have a single word about Lean Startups or Customer Development. There is no proselytizing about any particular methodology, yet the results are compelling. This is a radical departure from a traditional VC pitch. It will blow the minds of 70-80% of investors. The others will throw you out of their office. Will this type of presentation guarantee you funding? Of course not. Even if you have the worlds best Lessons Learned slides you might find out that your particular market (i.e. consumer Internet) might have a really, really high bar of achievement for funding. In fact, just trying to put three Lessons Learned slides together showing tangible progress will make most startups realize how hard really doing Customer Development is. Just started reading your blog, playing a lot of catch-up with the articles from before. This article is typical, very useful. I like how the tone adopted doesnt try to push stuff down my throat but at the same time disclaimers dont disclaim everything. looking forward to reading more of your older stuff and new ones obviously. Steve, best article yet. Your blog is on my must read list in Google Reader, and it’s always a great read. But this is one of your best… however can you do me a favour and delete it now I’ve read it? Isn’t it amazing that entrepreneurs need to be told to go after their customers? Good to see someone with authority advocating an approach to building startups that we at Agile Entrepreneurs focus on, week after week. Hopefully this will get more bootstrapping entrepreneurs focusing on making money instead of raising money. We also talk about cash flow management rather than fund-raising though – watch and justifying expenses by cash coming in that matches or exceeds. Good if you have your own money, better if the cash comes from investors, but best if it’s revenues from customers. DEAD NUTS ON TARGET! In my work with startups, I hear some variant of this question at least once a week. If tech startups spent as much time following the Customer Development process to validate the existence of paying customers as they do technical features, they would be much better served if and when it was time to raise money. And I have no doubt the VCs who have to listen to all the pitches would be happier as well. Great post! Standing ovation… but one caveat. Anything that is not a standard VC dozen format will get thrown away by a junior associate with MBA before it is ever seen by a partner. Sadly, VCs have their own process. Very helpful, as usual. Thanks, Steve. Great stuff Steve. Would you modify any of this if you had a B2B product instead of a B2C product, where every potential customer is also a potential competitor? Thanks. Nope. Progress is the same. Hi Steve, great post. I think you’re dead on. Question for you…on one of the first CafePress slides they mentioned raising a seed round in their first year – any advice on how to raise that initial round (i.e. prior to the Series A)? How would you suggest framing the story at that point when you’re still in the process of getting customer validation? I’ve read Four Steps a couple of times now (loved the Secret History of Silicon Valley) and enjoy your blog-posts…this is on target. Look forward to an opportunity to share a coffee with you at Cafe Borrone…(my old hangout) when we visit Bay Area in late May. 2. to be very transparent about my lessons learned, for example: I thought my market was A but it is really B, C, D, and E.
This is some of the best advice I’ve ever heard of when it comes to building a web startup in 2011. Why seek investment until you’ve got a business model that is already in process of iterating towards user needs and desires? Yes we tried the Customer Development Model when we developed a web apps for company secretary service. Not only we need to break the Malaysian cultural behavior who happen not to be too friendly with strangers from outside of their offices, we also need to break mentality from our team members as well in term of capturing the information from customers. We argued a lot with customers and sometimes it got frustrating when what we discovered was actually far much different than we had thought. But anyhow, without understanding our market, there is no way we could develop apps that is actually answering their problem in workplace. Steve, awesome stuff, thanks! I’ll redo my presentation today.